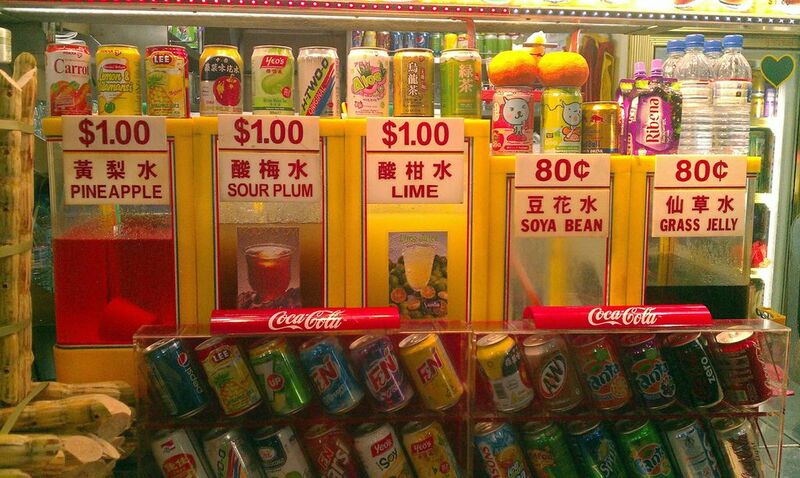 It was my first visit to Singapore. I was welcomed to this little island at the foot of Malaysia by Zainal, who met me at Changi Airport and was to chauffeur me by Bentley to my residence for the next 48 hours. In the car, delusions of being a rock star and wealthy oligarch went through my head as I admired the polished interior and my legs lauded the space after their eight-hour flight from Sydney. Zainal was polite and charming, answering my every question with a “Sir”. The car was immaculate and cooling compared with the humid evening as we approached the towering buildings of Singapore city. 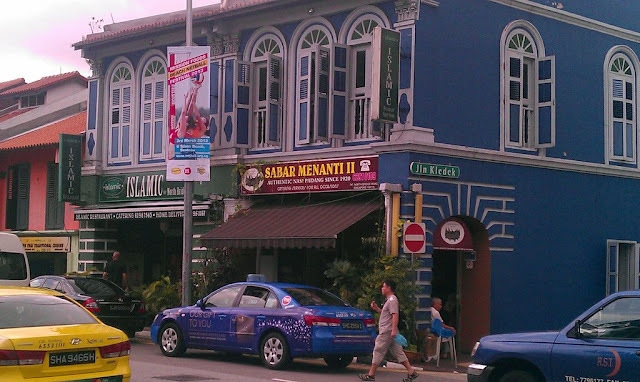 Singapore has a long history as a place of trade, and with it came a vibrant and diverse culture, which can still be seen in the street names today: Arab Street, French Road and Armenian Street, for instance. 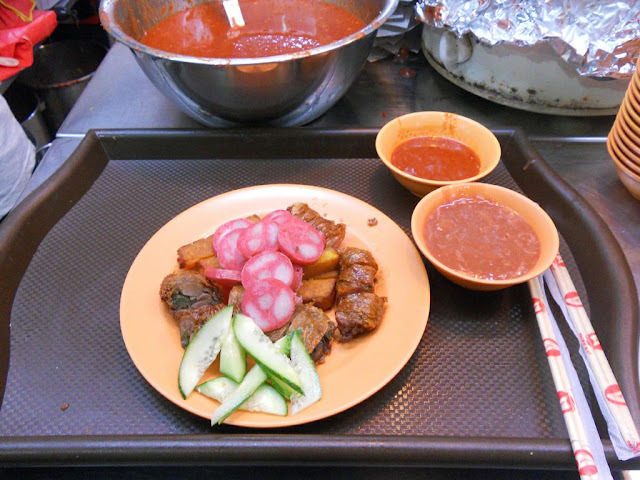 An island state, rich in variety of races, religions and languages, Singapore is home to one of the world’s most exuberant and varied food cultures. 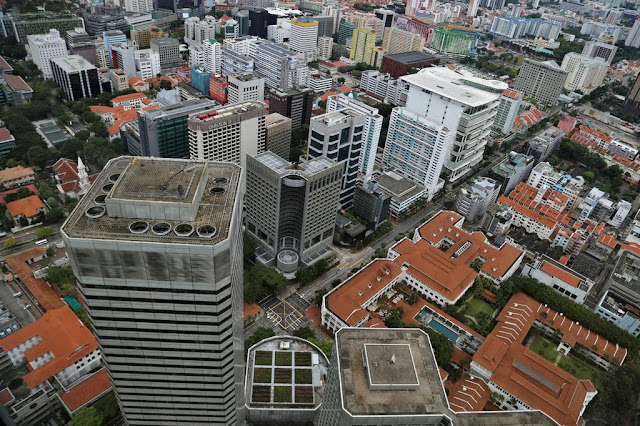 Though today’s Singapore is a centre for global banks and stock-market dealings, you can trace back the foundations of this little powerhouse of an island to one man, Sir Stamford Raffles, who laid down the plans for the development of the island after creating a trading post here for the East India Company in 1819. 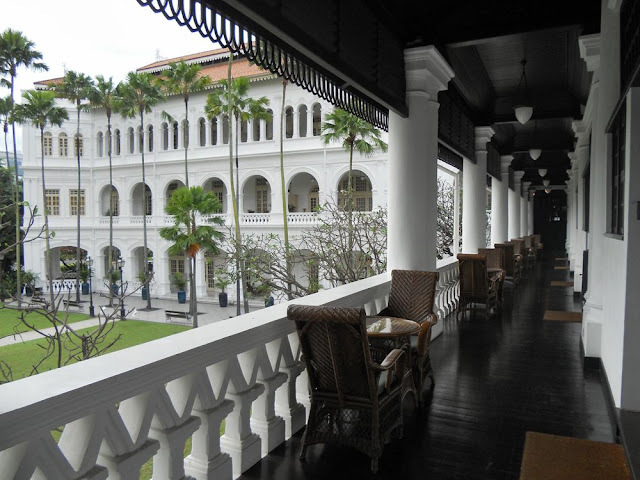 He is commemorated on more street names, buildings and plazas than any of the cultures that settled here, the most esteemed of which is assuredly my destination of 1 Beach Road, Singapore – Raffles Hotel. Being designated a national monument in 1987 gives a pretty good impression of the regard in which this establishment is held. It is undoubtedly one of the most famous hotels in the world, steeped in history and synonymous with a luxury reminiscent of a bygone era, when travel meant glamour and adventure. Immortalised in literature and chronicled in anecdotes for just over 125 years, Raffles has been the chosen residence for writers, presidents and nobility alike – Joseph Conrad, Somerset Maugham, Bill Clinton and Will and Kate are among those who have checked in here. Stepping out of the Bentley, I was greeted at the front of the hotel by Alvaro, who announced that he was to be my butler for the duration of my stay. It shouldn’t have come as a surprise, but I’d never had a butler before; my mind briefly drifted in a Downton direction. As I walked into the foyer I felt that here was something special indeed, and with none of the pomposity you might expect. I felt welcomed and secure, as if I were dropping in on the grand residence of an old friend. 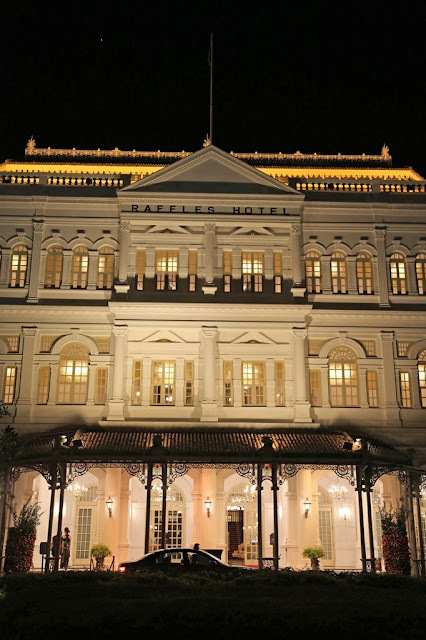 In this city of towering giants, Raffles stands no more than three stories high at its peak, adding to its charm and nodding towards the notion that bigger is not necessarily better. 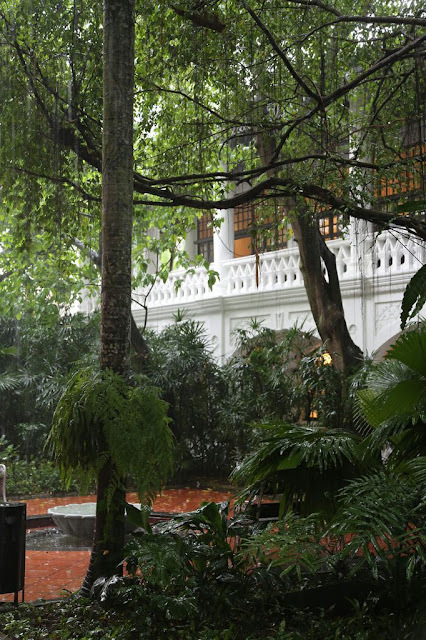 Established in 1887 and designed in an elegant colonial architectural style, with colonnades and courtyards filled with tropical palms, ferns and flowering shrubs, it really does feel like a tranquil escape from the hustle and bustle of life immediately outside. 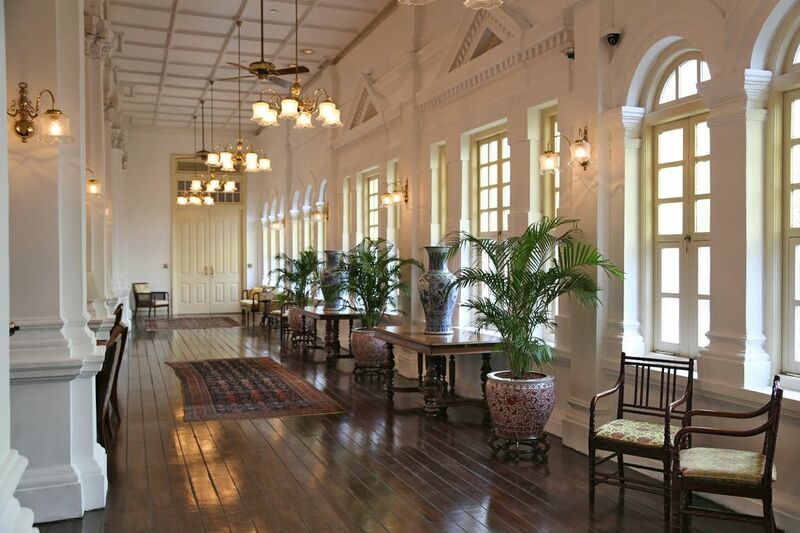 There are 103 spacious suites in total, with rattan seating on the verandas and old-world furnishings inside. Brass fittings and deep dark woods come as the norm along with all the usual mod cons you would expect, including TV and WiFi. I appreciated the layout of my suite. Through the door, you enter a small but useful reception area with a sofa, table and chairs. Then through a curtain-draped arch you walk into the bedroom, and through that is a dressing area at the rear, which leads to a bathroom stocked with Fragonard soaps. 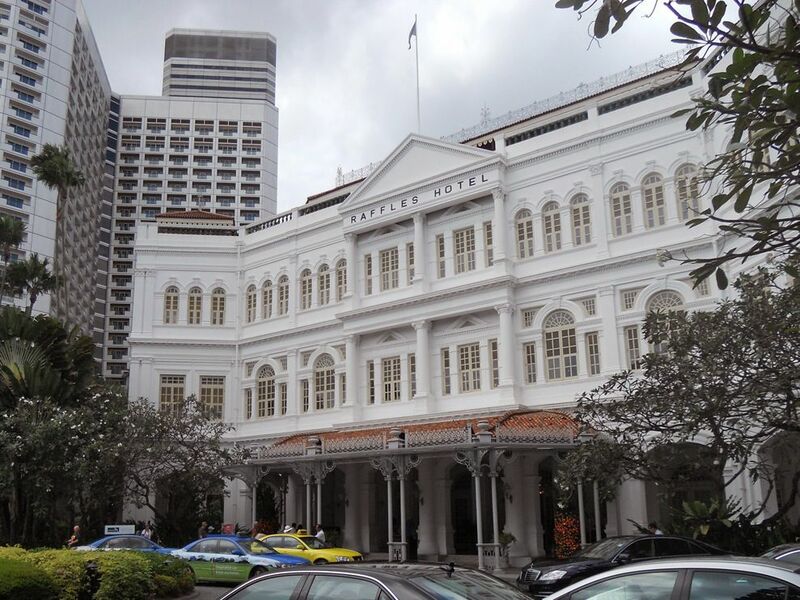 The Raffles has a spa, gym and pool, as well as a ballroom, theatre, shops (think the kind of brands you’d find in Bond Street or Mayfair, such as Tiffany and Louis Vuitton), and even a museum. The 15 top-notch places to eat and drink include the Tiffin Room, famed for its afternoon teas; the Bar and Billiard room, where a footloose tiger was spotted and shot dead in 1902; the Long Bar, synonymous with the Singapore Sling; and the fabulous Long Bar Steak House, which serves well-sourced prime-grade American and Australian Wagyu beef – for the trans–Pacific ‘tour’ order the tasting of filet mignon, it’s a real education. If you want it you can probably find it here – the hotel even has its own bakery. 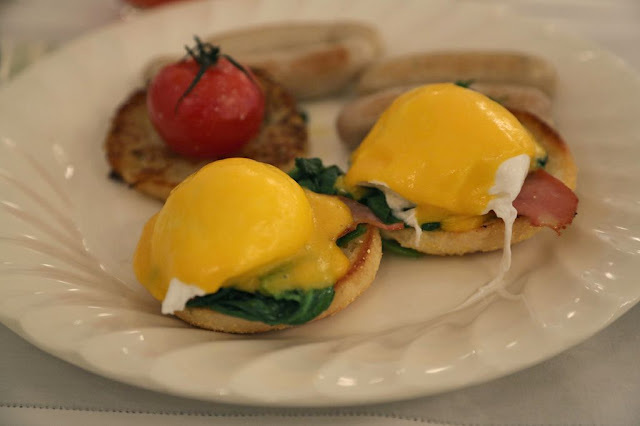 Breakfasts are served in the Tiffin room. The mixed buffet included excellent dim sum (the chicken dumpling was incredibly light and fluffy), along with a menu of cooked dishes to choose from. 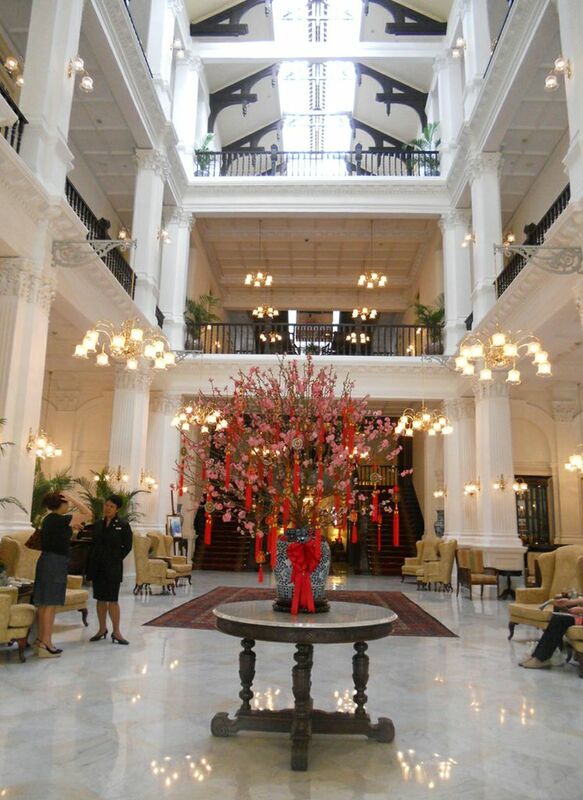 Above and beyond the splendid building, the air of history and the gracious atmosphere, I realised the thing, the golden element, that made my stay at Raffles so special was the staff. They were absolutely fantastic – attentive, couldn’t do enough for you but simultaneously unobtrusive. If you are in Singapore and have the budget for just one indulgence, make it a stay at Raffles. From unique hawker fare to some of the best restaurants in the world, Singapore has it all – the food is a fantastic mix of Indian, Chinese, Malay, European and Peranakan, a fusion of Chinese and Malay cuisines. 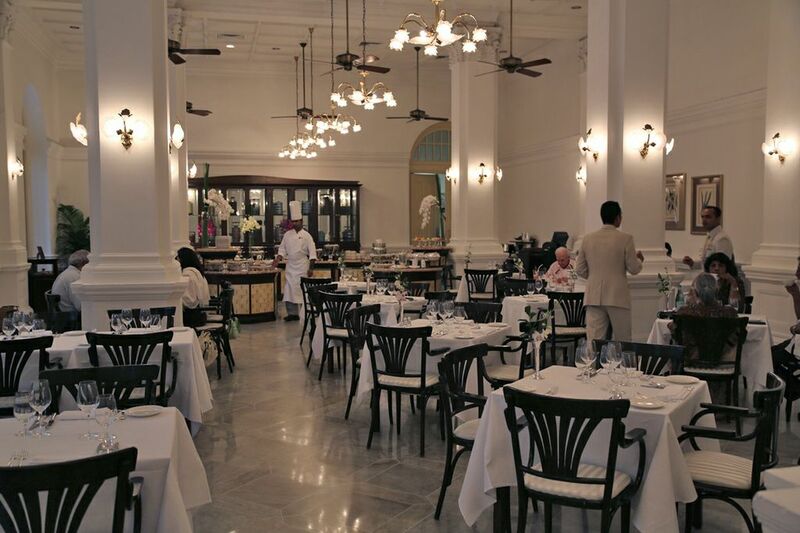 My first evening I dined at the Raffles Grill with Annie. Sitting down for dinner we were offered a glass of celebratory Billecart-Salmon Brut Réserve Champagne, sourced by wine director and sommelier Stéphane Soret for the big celebration a few months earlier, when Raffles marked the start of its 125th year on 16 September 2012. This was very palatable, light and refined. It comes from one of the few Champagne houses to be owned by the original family, which was established in 1818 by Nicolas-Francois Billecart – one year before Raffles drew up his plans for Singapore. The menu on offer is seasonal French/European, which at first might seem an odd concept in Asia, but when you realise that Singapore needs to import nearly everything it consumes, I guess it’s a case of if you have to import it, why not import the best. Deputy Executive Chef Nicola Canuti (Italian by birth, a prodigy of Alain Ducasse by trade) explained the menu before we chose. To receive the full culinary experience I opted for the degustation menu, and when I mentioned that I’d never tried sea urchin, not part of the selection, chef made us an extra appetiser as well. 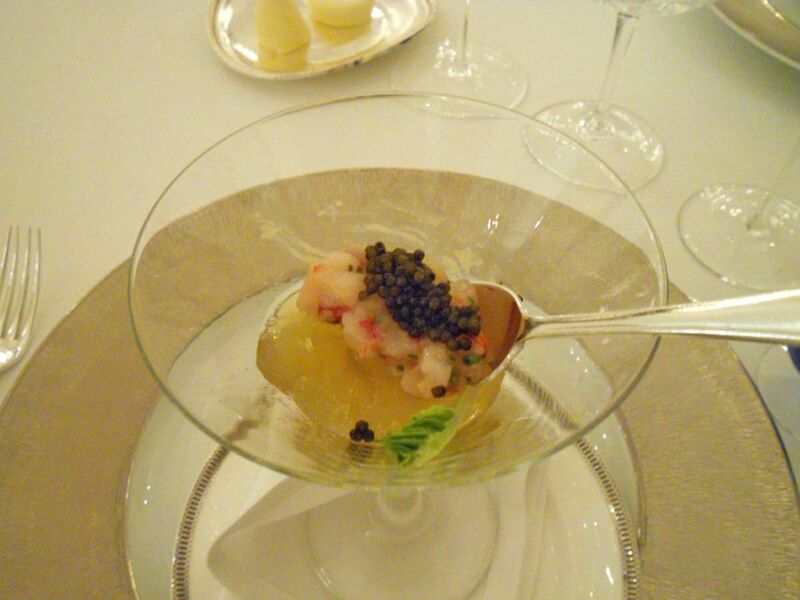 We kicked off with the red prawn with shellfish bisque jelly, sea urchin and Kristal caviar. On paper this looked like it might have been a very fishy start to proceedings, yet it was anything but. The flavours were subtle and light. A cold dish, the bisque jelly was very refreshing, almost cleansing and perfect in the humidity of Singapore. There was a subtle hit of saltiness from the caviar and urchin and a firm bite to the prawn. This was followed by smoked salmon with royal palm heart salad. 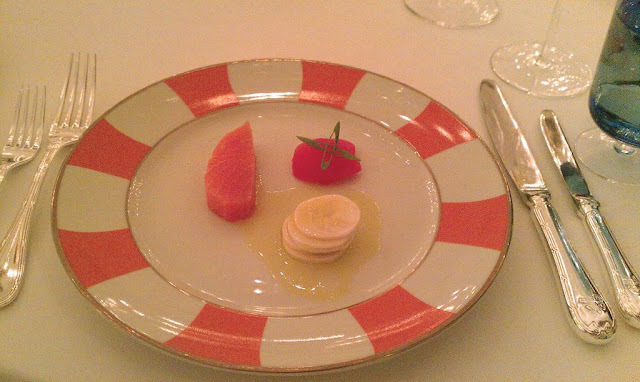 The salmon was a luxurious, melt-in-the-mouth morsel, with a soft jelly bite and no flakes in sight, which combined very well with the water-chestnut-like crunch of the palm heart and the lemony vinaigrette. To go with our not-too-fishy appetisers, Stéphane recommended a Meursault Burgundy from the small-yielding Domaine Arnaud Ente. It became clear that Arnaud strives for quality rather than quantity as we sample the clean and delicious white, one of only 5,969 bottles produced. If you’ve never tried it before, track it down. 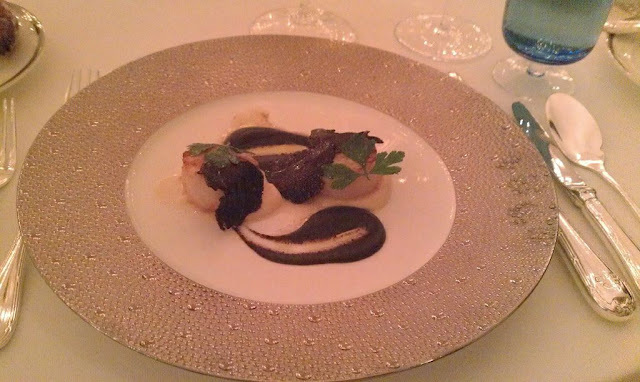 Next came Brittany scallops, black truffle velouté with celeriac purée. Wow. The scallops were al dente and sweet on taste, the truffle velouté a nice big flavoursome hug and the celariac purée a warm reminder of home. 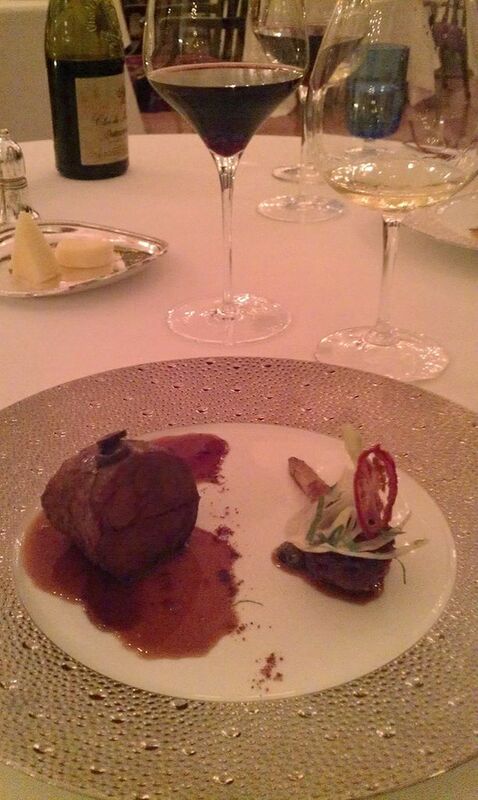 It was a gentle transition to our next dish, the lamb. The Welsh shoulder was rolled and slow cooked for 36 hours, after which I was surprised it still held together – but it did and it was tender, juicy and delicious. There was a little spice and an earthy edge brought to the dish by the herbs, sundried tomato and a fennel crisp.To match the dish, Stéphane recommended a rousing and robust Chateauneuf Du Pape, incidently the region he hails from. Room for pud? First though Stéphane offers us a 1965 Armagnac. By now I’ve cottoned on to the fact that this won’t be anything ordinary, it will be well sourced and present at the table only with justification. It was sublime and deeply comforting – if you had any worries this would probably take them away. Again, this elegant drink was sourced and bottled in limited numbers especially for Raffles, and presented in a glass designed by the sommelier himself. 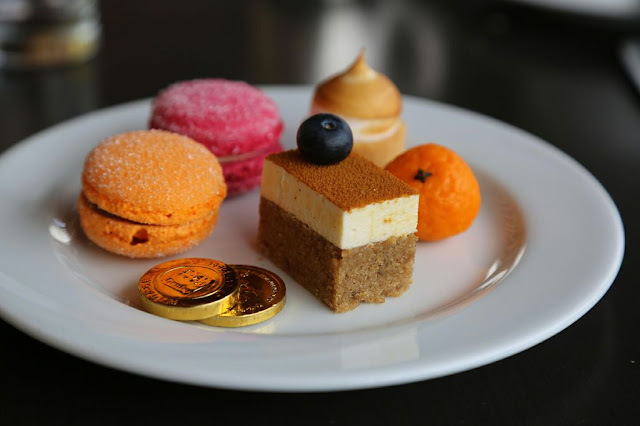 We ate petit fours while sipping the Armagnac and contemplating the finer things in life. An aromatic Earl Grey and pear sponge was followed by fine pistachio biscuit with a central grape ‘explosion’ and then a strawberry marshmallow full of childhood nostalgia. Glorious. Before coffees, the sorbet. La Mandarine consisted of marinated mandarin in green walnut liquor, mandarin espuma and ginger mandarin sorbet, a palate-cleansing finish to a true feast, although I saved just a little bit of Armagnac in my glass to savour as my finale, before retiring for the evening. 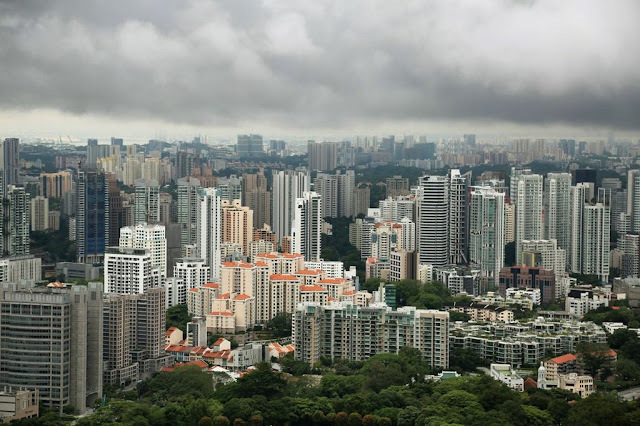 It seems as though you are able to walk around the entire city of Singapore via underground shopping malls, hunting for that fabled elusive bargain, but as the balance of global economy isn’t necessarily in favour of the pound these days, those bargains are more elusive than you might think. 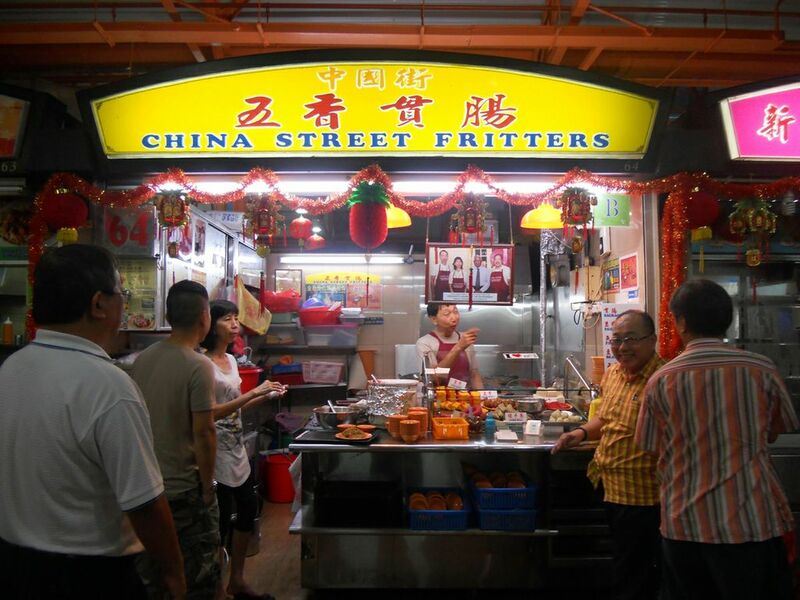 Besides, there’s far more to Singapore than shopping, especially for food lovers. Out of the malls, Singapore goes up… and up. This little island is reaching for the sky in such a big way it makes Canary Wharf look like a school project. To get an idea of this you can either jump on the Singapore Flyer, a bigger version of the London Eye, or do as I did and take high tea (no pun intended) at the Equinox restaurant on the 70th floor of the Swissotel. It’s served daily from 3.30 to 5pm, but I would strongly recommend booking, as at 3.31pm it is likely to be full. 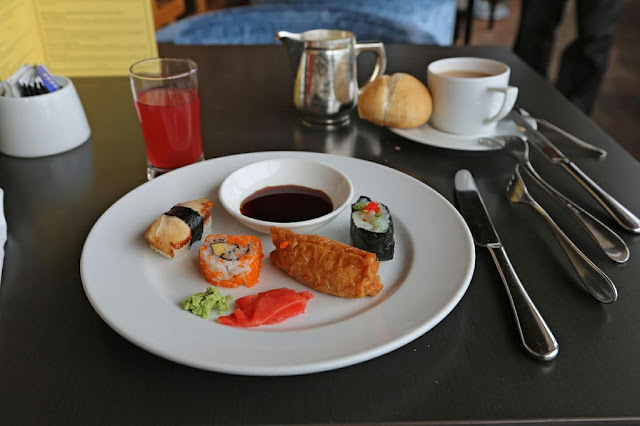 The buffet was high-standard Chinese, Japanese, Malaysian, Indian and European fare – accompanied by endless cups of the tea of your choice. The cakes and desserts in particular were fantastic. Meanwhile, children were oblivious to the breathtaking view because for them the chocolate fountain was the most important thing on the planet. On ground level it’s worth exploring Singapore’s rich and varied cultural districts. 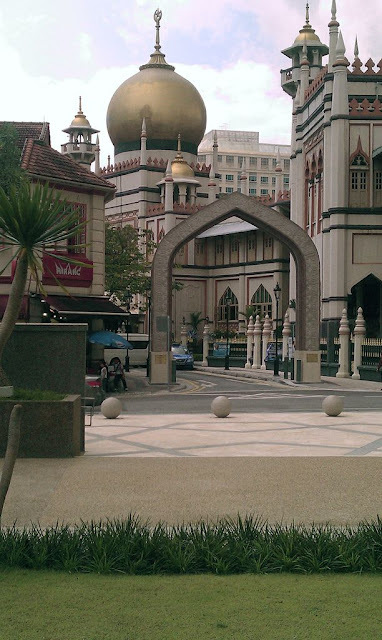 It is well worth the easy walk between the Arab Quarter and Little India to explore the teeming streets, bazaars, temples and mosques. In the Arab Quarter I searched out nasi pandang. Pariaman Warong was highly recommended to me – it’s very popular with the locals, so get there before noon or they may well have sold out and closed up (as they had when I arrived at 12.40pm). Instead, I ate at the Sabar Menanti II. 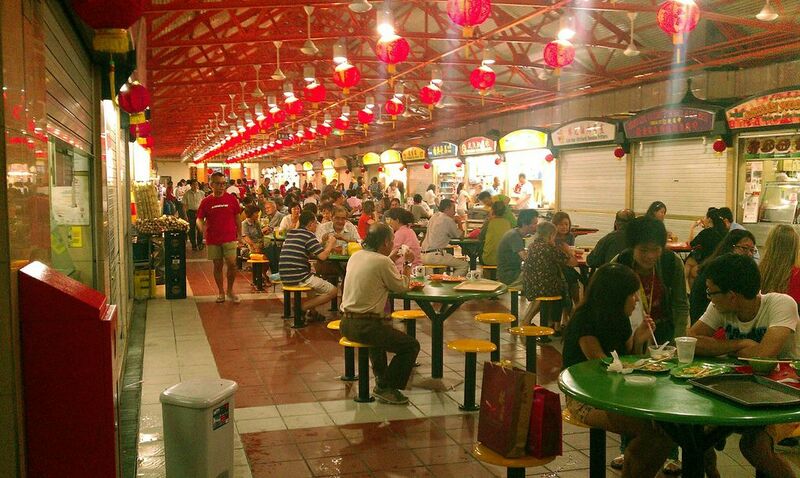 The atmosphere here was local and the crowd dining were a varied mix of races and religions. 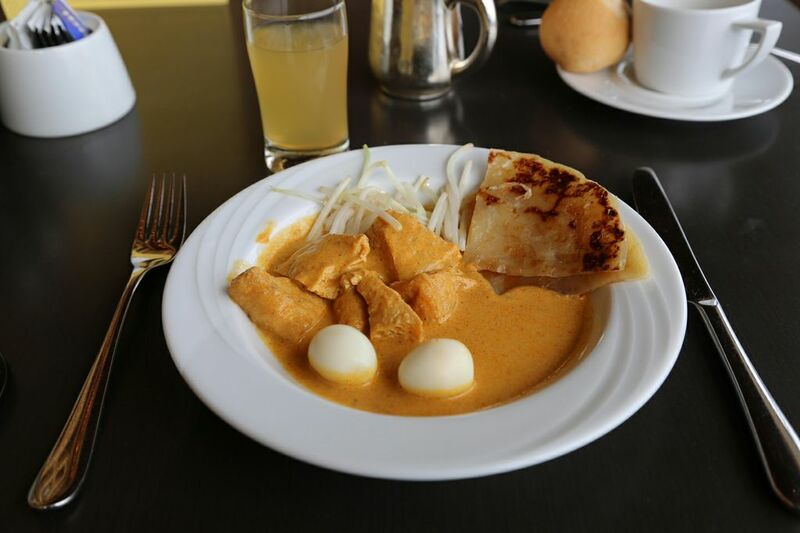 The food was great value and scrumptious. 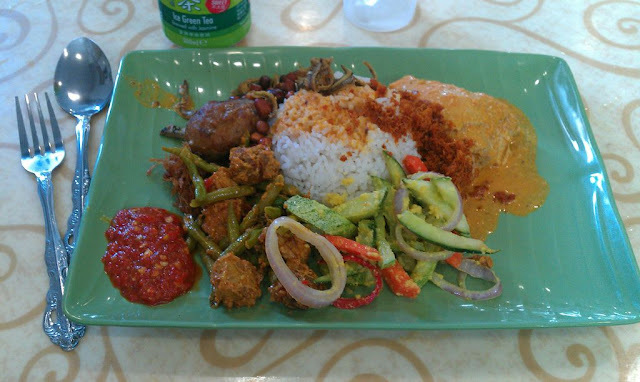 That afternoon I had planned to visit the well-known Banana Leaf Apollo in Little India, but I was stuffed full after the nasi pendang and although the food looked fantastic every diner in there looked like me – a tourist. Instead, I decided to walk off my enormous lunch. On the opposite side of the river to the Arab and Indian quarters is Chinatown, worth a visit for its markets, food halls and the enormous Budda Tooth Relic temple. Maxwell Food Center sits near the end of South Bridge Road, and houses more than 100 hawker stalls, providing one of the biggest varieties of local food in Singapore – all at incredibly reasonable prices. The more popular stalls can sell out and the choice can be mind-boggling, so if you’re in doubt what to try, join a queue – it’ll probably be great. When you’re surrounded by buildings so high it’s worth mentioning that there are some parts of Singapore where there’s earth under foot. 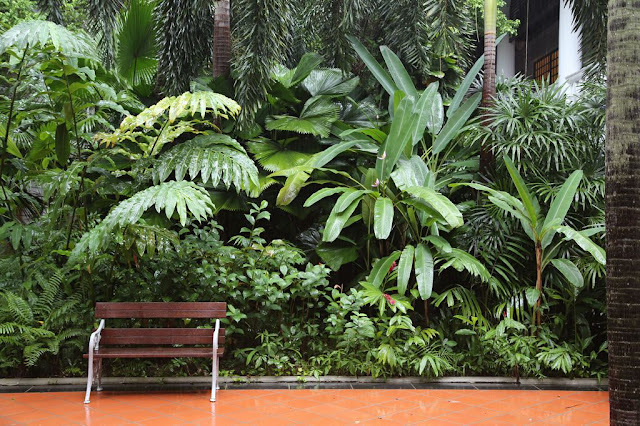 The fantastic Botanical Gardens lie just northwest to the end of Orchard Road, but if you travel further (about 40 minutes’ drive out of town) you can get to the Kranji countryside. 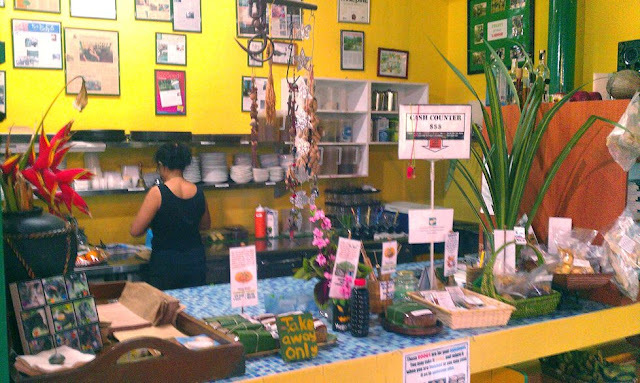 On the north-western edge of the island in the tropical landscape are a number of farms and organic producers who work to promote local agriculture and food production. If you are interested in sustainability and conservation, this area is definitely worth a visit. Being a keen allotment-holder in London, I had to visit Bollywood Veggies, a 10-acre smallholding started in 2000 by Ivy Singh and her husband Lim Ho Seng in their retirement years. The bistro menu is based on what grows in the garden, but as the climate allows for a 12-month growing season produce stays fresh and varied all year round. 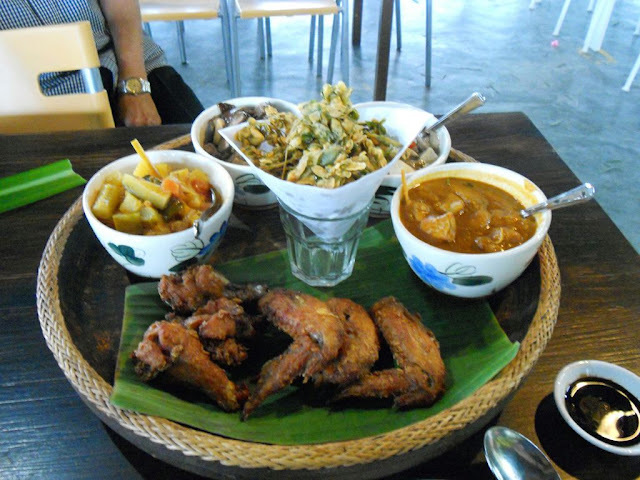 I sampled the Warrior’s Platter, a brilliant combination of various curries and tempuras including a moreish mushroom and chicken curry, a sweet and sour fish curry, perfect crisp-fried chicken and a fantastic moringa (also know as the horseradish tree or drumstick tree) leaf tempura. I was told the leaf contains more calcium than milk, and the flavour was superb. The food here is super fresh and good value for money. Heading the bistro is Lynn Ee. I wondered why a Cordon Bleu-trained chef ended up in such a remote setting, when there are so many restaurants she could work for in the city. But talking to Lynn, you soon realise her heartfelt passion for sustainable food and mission to empower ordinary people to take action in the kitchen is what really drives her. 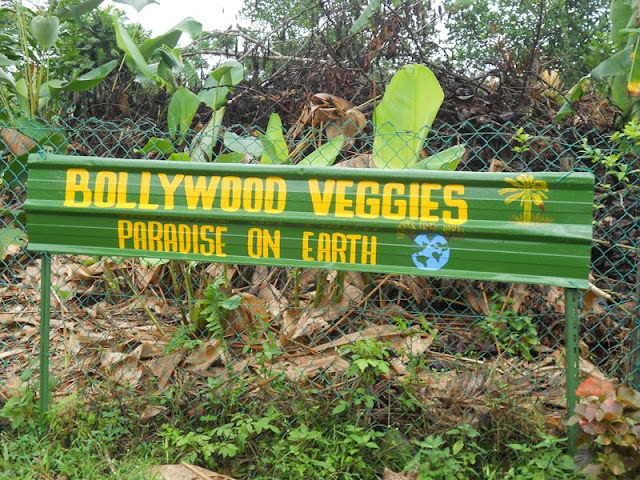 Bollywood Veggies is an inspiring place maintained by inspiring people. It’s a refreshing trip out of town and I would highly recommend a visit. 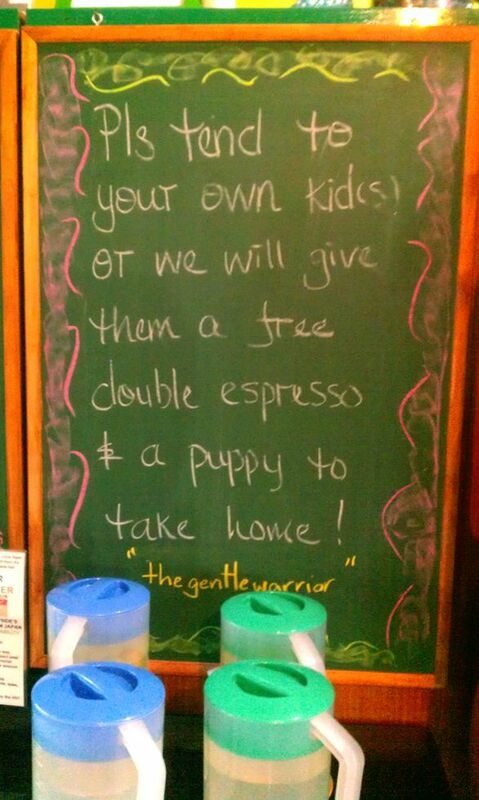 They also have a great sense of humour. Glenn Orton stayed in a Palm Court Suite at Raffles Hotel, which costs S$1,500 (£800) per night and includes breakfast. 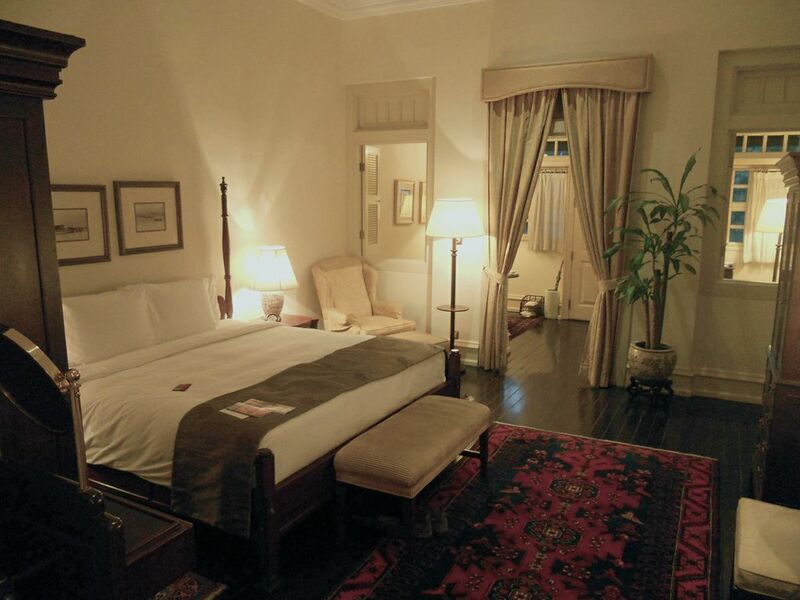 Suites start at S$1,400 (£740) per night including breakfast. I have visited the Raffles hotel several times, actually that is a wonderful place to held parties.